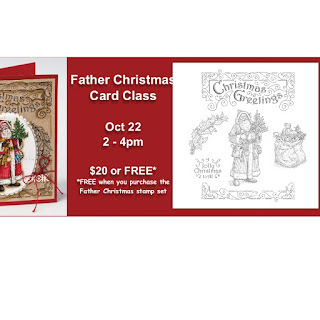 Want to come to a class and spend a few fun hours making cards? Then check out the classes I have coming up. Come along for a few hours of hours of fun with friends and learn how to make greeting cards. Every week is something new and you never know surprises I may have in store. You must RSVP and let me know you are coming so I can have a kit ready for you. Address will be supplied when you RSVP if you don't already have it. Image above is only an indication and not necessarily the cards we will be making. Christmas will come up very fast now. So it's time to get started on your Christmas Cards. Come along to this class for lots and fun and make some gorgeous Christmas cards. Each class we will use a different stamp set and I will show you several different ways of using it. This class we will be highlighting Father Christmas. Come along for an afternoon of fun as we make the Tin of Cards kit. to be boring? 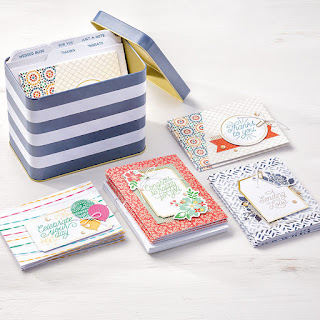 This fun printed tin gives you plenty of room to store the cards that you make from this kit, plus room for more. 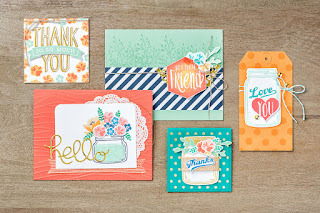 Kit includes tin and enough card bases, accents, and envelopes for 16 cards, 4 each of 4 designs. There are two price points for this class. Cost - $92 This is for the Tin of Cards Kit & the coordinating stamp set. If you do not purchase the stamp set, it's ok, you can use mine. But please be aware that this means you will experience some down time while waiting for the stamp you need. Because this is a Kit based class, I need to order the kits before class, so RSVP and payments at least one week before the class date is ESSENTIAL.